String Team - Learn To Play Day a Great Success! 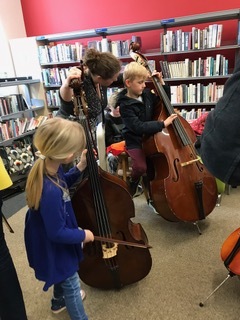 Truro Library was buzzing with excitement for the Learn to Play Day on Saturday March 23rd where Cornwall Music Service Trust focused their event on the instruments of the String Family. 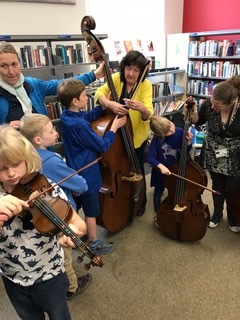 The double bass proved to go down a storm with a number children wanting to give this instrument a go. From the moment the library opens its doors we had a constant stream of people from age 3 to 63 interested to see what was going on in the normally quiet venue. A very successful event indeed and our thanks go to Crea and the staff at Truro Library. Photo of the CMST teaching staff from left to right. Jane, Sian, Claudia, Karen, Hywel.